Sưu tầm – What is Private Company Valuation? Private company valuation is the set of procedures used to appraise a company’s current net worth. For public companies, this is relatively straightforward: we can simply retrieve the company’s stock price and the number of shares outstanding from databases such as Google Finance. The value of the public company, also called market capitalization, is the product of the said two values. Such an approach, however, will not work with private companies, since information regarding their stock value is not publicly listed. Moreover, as privately held firms often are not required to operate by the stringent accounting and reporting standards that govern public firms, their financial statements may be inconsistent and unstandardized, and as such, are more difficult to interpret. Here, we will introduce three common methods for valuing private companies, using data available to the public. The Comparable Company Analysis (CCA) method operates under the assumption that similar firms in the same industry have similar multiples. When the financial information of the private company is not publicly available, we search for companies that are similar to our target valuation and determine the value of the target firm using the comparable firms’ multiples. This is the most common private company valuation method. To apply this method, we first identify the target firm’s characteristics in size, industry, operation, etc., and establish a “peer group” of companies that share the similar characteristics. We then collect the multiples of these companies and calculate the industry average. While the choices of multiples can depend on the industry and growth stage of firms, we hereby provide an example of valuation using the EBITDA multiple, as it is one of the most commonly used multiples. Where, the Multiple (M) is the average of Enterprise Value/EBITDA of comparable firms, and the EBITDA of the target firm is typically projected for the next twelve months. The image shown above is a Comps Table from CFI’s Business Valuation Course. The Discounted Cash Flow (DCF) method takes the CCA method one-step further. As with the CCA method, we estimate the target’s discounted cash flow estimations, based on acquired financial information from its publicly-traded peers. We usually use the firm’s weighted average cost of capital (WACC) as the appropriate discount rate. To derive a firm’s WACC, we need to know its cost of equity, cost of debt, tax rate, and capital structure. Cost of equity is calculated using the Capital Asset Pricing Model (CAPM). We estimate the firm’s beta by taking the industry average beta. Cost of debt is dependent on the target’s credit profile, which affects the interest rate at which it incurs debt. We also refer to the target’s public peers to find the industry norm of tax rate and capital structure. Once we have the weights of debt and equity, cost of debt, and cost of equity, we can derive the WACC. It should be noted that performing a DCF analysis requires significant financial modeling experience. The best way to learn financial modeling is through practice and direct instruction from a professional. CFI’s financial modeling course is one of the easiest ways to learn this skill. The First Chicago Method is a combination of multiple-based valuation method and discounted cash flow method. The distinct feature of this method lies in its consideration of various scenarios of the target firm’s payoffs. Usually, this method involves the construction of three scenarios: a best-case (as stated in the firm’s business plan), a base-case (the most likely scenario), and a worst-case scenario. A probability is assigned to each case. We apply the same approach in the first two methods to project case-specific cash flows and growths rates for several years (typically a five-year forecast period). We also project the terminal value of the firm using the Gordon Growth Model. Subsequently, valuation of each case is derived using DCF method. 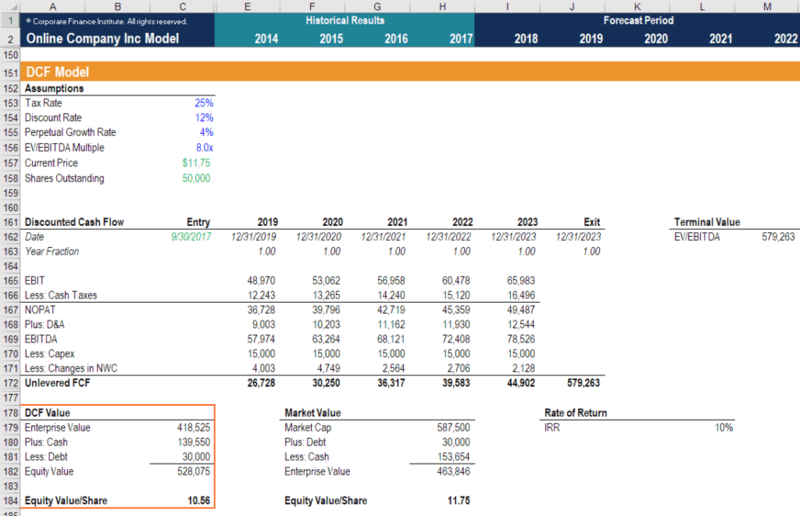 Finally, we arrive at the valuation of target firm by taking the probability-weighted average of the three scenarios. 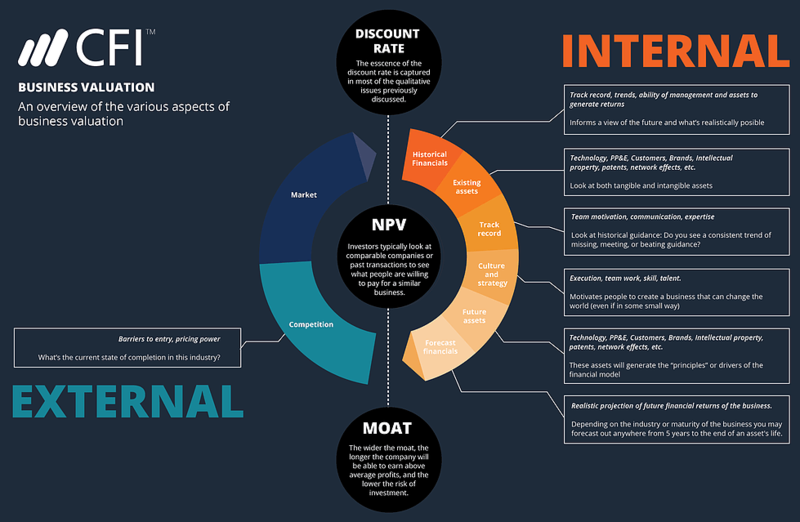 This private company valuation method can be used by venture capitalists and private equity investors as it provides a valuation that incorporates both the firm’s upside potential and downside risk. As we can see, private company valuation is primarily constructed from assumptions and estimations. While taking the industry average on multiples and growth rates provides a decent guess for the true value of the target firm, it cannot account for extreme one-time events that affected the comparable public firm’s value. As such, we need to adjust for a more reliable rate, excluding the effects of such rare events. Additionally, recent transactions in the industry such as acquisitions, mergers, or IPOs can provide us with financial information that gives a far more sophisticated estimate of the target firm’s worth.